“I want to say with all emphasis that I never took even one naira from Dasuki. Beyond that, I want to assert that I never had any relationship with Dasuki. I knew Dasuki way back in 1986-87,when he was ADC to General Babagida and I was Secretary to the Federal Government. Since he left that government around 1987, I had no contact or dealing with him; absolutely none”. 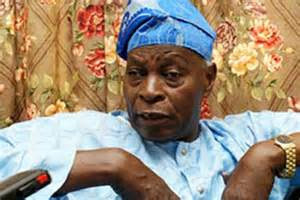 “The N100 million they are bandying about in the media, the one that I know about, it happened as follows: Chief Tony Anenih, a former Chairman of the Board of Trustees of the PDP, phoned me late January last year and said he would like to see me; he would like to come from Abuja to see me in Akure. And he came. He came with someone, and I, too, invited somebody to be with me. The four of us were together in the meeting; and Chief Anenih said they were observing that my party, SDP, had no presidential candidate and, therefore, they would want us to ask our supporters to vote for his own party’s candidate, President Goodluck Jonathan”. “I told him that, in principle, there was nothing wrong with the two parties collaborating, but that the collaboration must be a principled collaboration: it must be based on principles. I told him that there were certain things we desired the government to do but they had not done for the people, and that if we were going to support their candidate, they must commit themselves to make changes in those areas. He asked for the areas? I said number one, their party must be prepared to restructure Nigeria from the colossal unity system, and the best way of doing that was to fully implement the report of the National Conference 2014”. “Number two, that the party must commit itself to a policy of zero tolerance for corruption because I saw that corruption was monumental in what they were doing. Number three, I said the party in government must destroy Boko Haram and give stability to Nigeria. Number four, there was mass unemployment and youths were getting frustrated, that they must articulate programmes to create jobs for the unemployed. Number five, that I observed that the party in government was spending virtually our entire revenue on recurrent expenditure, that they must reduce recurrent expenditure so as to generate surpluses to finance capital development like roads, schools, hospitals, etc”. “Item number six, that if we accepted this tide and accepted them, then if the party won the election, we will expect reasonable participation in that government. And he said they were totally happy with all these strict conditions, that the conditions were acceptable to them; in fact, he said they were already implementing some of them. So, on that note, he returned to Abuja. But after he left, I decided to write to him in order to document this relationship. The letter I wrote to him, again I listed the six conditions which I had mentioned in our oral discussion. And three days later, he wrote back to me saying that he had consulted all the stakeholders of his party including the President and they were all happy to accept those conditions to work with the SDP in the election’s that were forthcoming”. “So, having accepted our conditions, I proceeded to Abuja to summon the meeting of my party executive and decision making organs and made the presentation to them. There was a very robust debate and, at the end of the debate, the executive committee of my party endorsed their request that we should work with Jonathan in the elections”.